Looking back on a season that began with nine straight wins, a 25-5 record by New Year's Day and a 40-12 mark in mid-February, Paul George offered a brief assessment of the 2013-14 Indiana Pacers: "We peaked too early." With a new campaign approaching, it seems the '14-'15 edition won't peak at all. You know why. Either you saw Paul George's right leg shatter live during the USA Basketball Showcase, or you watched it later because you had to scratch the itch, or you avoided it, preferring the awful imagining of the image to stark certainty. But you know. You know that the All-NBA forward — Indy's leading scorer, arguably the game's best two-way player, the one guy the Pacers couldn't lose — is lost, and that optimism and hope for an early return don't change reality. "At that moment, the light went out," Pacers leader David West said on media day, according to Candace Buckner of the Indianapolis Star. "[...] What we were looking for, obviously what our goals were as a group the last couple years, the light just went out on that." A Pacers team built around defense, toughness and togetherness might have been able to bounce back from their abysmal close to the season. Indiana might have been able to shake off the dreadful stretch that saw them play barely-.500 ball after the All-Star break before being pushed to seven games by a sub-.500 No. 8 seed and losing home-court advantage in three straight playoff series. The Pacers may have been able to recover after watching their season end, for the third year in a row, at the hands of the Miami Heat. They may even have been able weather the loss of Lance Stephenson, who chose to take his on-court absurdity, locker-room instigation and emerging two-way talents to North Carolina in free agency, a decision that Pacers president Larry Bird called "disappointing," but that could — maybe — have represented addition by subtraction. Coming back after the gruesome exit of their signature star, though? Sorry. Turn out the lights. The party's over. "You have to give yourself a realistic starting point," West said. "So, obviously, we can't be talking about competing for a championship, even being in title contention." A silver lining: With dashed hopes come lowered expectations, the element of surprise and the chance for growth. Can Frank Vogel finally learn how to coax productive minutes out of his reserves? Will the absence of George and Stephenson prompt added balance and variety in an offense that's been stagnant for the last two years? Can the much-derided Roy Hibbert and George Hill grow to fill the void? 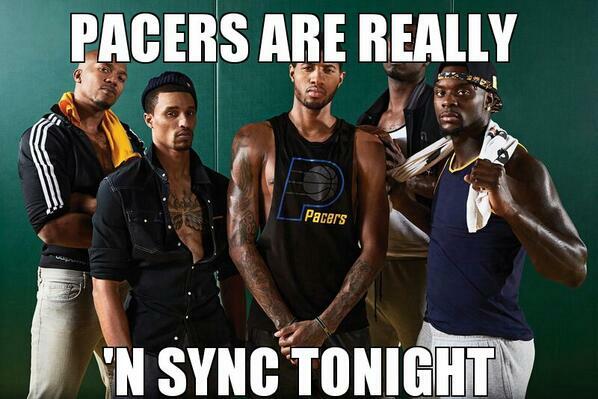 Without their star, their wild card and any hope of a ring, can the Pacers find themselves? Unstoppable ride to glory derailed by poor fashion, a disappearing giant + dysfunction, offensive + otherwise. Utter collapse. LeBron again. George and Stephenson accounted for 35.5 percent of Indiana's total points from last season, 38.9 percent of its assists, 48.7 percent of its 3-pointers, and the more difficult to define, but still real and valuable, creation of openings for their teammates by demanding defenders' attention. They did this while also serving as the top two perimeter defenders on the league's stingiest defensive unit. Vogel had at least one of them on the floor for more than 70 percent of the Pacers' minutes last season, whether as part of the most heavily-used five-man lineup in the NBA or, in Stephenson's case, to prop up reserve-heavy lineups in need of playmaking. That's all gone now. While the Pacers' primary pair of offseason acquisitions — former Cleveland Cavaliers shooter C.J. Miles, imported on a four-year, $18 million deal, and ex-Detroit Pistons combo guard Rodney Stuckey, snared for the veteran minimum — will eat up plenty of minutes on the wing, it's difficult to imagine them totally filling the gaping holes in Indiana's rotation. It took the Pacers years to develop the chemistry, continuity and organizational identity that produced consecutive Eastern Conference finals berths. Finding a way to maintain it all while replacing one core piece after Stephenson's exit was going to be difficult enough. Doing so while replacing two after George's injury — especially when the injury comes in early August, when free agency's largely dried up, your cap space is cashed and your owner won't go into the luxury tax for reinforcements — is all but impossible, and makes this about as brutal a summer as Indiana could've had. For Indiana to avoid the NBA's offensive basement, it'll have to be the Miles-and-Stuckey combo. The 6-foot-6 Miles will be counted on to maintain the impressive per-minute scoring and long-range marksmanship of his time in Cleveland — just under 19 points per 36 minutes on 38.8 percent shooting from 3-point land — while playing more minutes and assuming a larger role on a team whose primary ball-handlers won't command as much defensive attention as Kyrie Irving. After going from "star point guard of the future" to "reserve shooting guard for the time being" in Detroit, Stuckey will likely be expected to lead Indiana's second unit, providing something like a B-level Lance impression — driving to the basket, getting to the foul line, serving as a secondary playmaker, posting up smaller defenders, authoring the occasional offensive explosion — for a Pacers squad that needs shot creation. Neither Miles nor Stuckey can match George or Stephenson's work as wing stoppers, but both must pitch in defensively to help keep the Pacers' defense near the top of the league. Playing in a strong, consistent system under Vogel's coaching should help two players who've had rarely had scheme continuity; Miles played for four different coaches over the last four seasons, while Stuckey had six in his seven years in Detroit. If they can do their job while making the most of their offensive opportunities, Indy's decline on the wing might not be as catastrophic as we feared. If they can't, though, the Pacers will sink to the bottom faster than you can say "Chris Collingwood and Adam Schlesinger." Offense. Indiana ranked 22nd among 30 teams in points scored per possession last season. It finished 19th in both effective field-goal percentage (which accounts for 3-pointers being worth more than 2s) and true shooting percentage (which measures accuracy on field goals, 3-point field goals and free throws) and 27th in assist ratio (an estimate of how many helpers a team logs per 100 possessions). They were worse across the board during their post-All-Star-break swoon. And they did all that with their two best offensive perimeter players. Who's going to create scoring chances on the '14-'15 Pacers? Vogel figures to rely more heavily on West's ability to make something happen with the ball at the top of the key, as he did during Indiana's series-clinching win against the Washington Wizards. The power forward logged the 10th-most "elbow touches" in the league last season, averaging 7.4 such midrange moments per game, according to the NBA's SportVU player tracking data; it wouldn't be surprising to see him move up that list given more playmaking responsibility. "We've got a winning culture, a winning system. We've got David West," Vogel told Buckner. "Everybody seems to forget we've got David West." While we're remembering things, though: West is 34 years old, with 12 pro seasons and more than 26,000 hard-earned NBA minutes on his legs, including that surgically repaired left one. More than 30 minutes a night — especially with an increased offensive workload — might be too much to expect from the 6-foot-9, 240-pound bruiser at this stage. "It'll be one of those years where the older you get, the more you'll have to listen to your body," West said on media day. Vogel's also talking up a larger role for George Hill. The point guard "used" a career-low share of his team's offensive possessions last season — just 14.8 percent of the Pacers' trips during Hill's minutes ended with the IUPUI product attempting a field goal, getting fouled or committing a turnover. Vogel sees that trending up this year. "Handling the ball more than in the last couple years, I think George is going to be more assertive," Vogel said, according to Zach Osterman of the Star. "I'm going to put him in positions to be more assertive." Hill has shown a capacity to create in the past — he produced a sterling 0.98 points per possession finished as the ball-handler in the pick-and-roll, the 11th-best mark in the league, during his first year in Indiana, according to Synergy Sports Technology — and he's a higher-class option as a facilitator than backup C.J. Watson, who's been more of a spot-up shooter than an on-ball playmaker over the last few seasons. But he's got a long way to go to be as proficient a creator, for himself and others, as the guys whose slack he's picking up, and Vogel doesn't have many other options if he can't. Hibbert. Vogel spun his center's offensive vanishing act last season as a product of the team's circumstances — "I think a lot of Roy struggling was the emergence of Lance Stephenson and Paul George." There's some truth to that; the Pacers' horrendous entry passing didn't do Hibbert any favors, either. But anyone who watched Hibbert's months-long implosion last season saw plenty of problems that had nothing to do with a lack of service from his perimeter partners — the ease with which he was pushed off his position on the block; the off-balance, two-left-feet backdowns once he received the ball; the awkward half-hooks shotputted like baked hams over smaller defenders. And anyone watching the Pacers implode had a sneaking suspicion that Hibbert's problems were as much between his ears as between the lines. "I think it's all confidence [with Roy]," Bird recently told TNT's Reggie Miller. "I think a lot of guys, when they miss shots, they get down on themselves. Roy looks at the big picture — 'How did I play on the offensive and defensive end? How did I rebound the ball? Did my teammates get me involved?' If he loses his confidence, it's harder for him to get it back than most guys." After looking completely vestigial against the spread-it-out-and-bomb-away Atlanta Hawks and putting up a goose egg in a second-round-opening loss to the Wizards, Hibbert did seem to find some sense of self, averaging 12.6 points and 7.2 rebounds on 49 percent shooting over the next 11 games against the Wizards and Heat. But while critiques of Hibbert's counting-stat contributions have been mitigated by praise for his work on the other end, such "gotta hear both sides" defenses are likely to fall by the wayside this season. To keep the wolves at bay, Hibbert must boost his scoring, rebounding, aggressiveness and leadership. 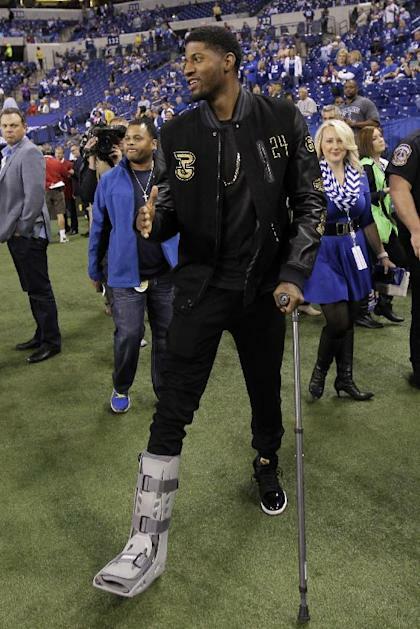 For the reeling Pacers to have any hope of postseason contention, he'll have to. 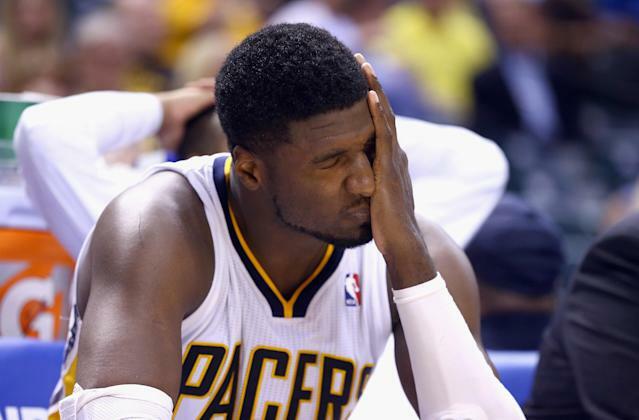 OK, we're officially stretching "breakout" and "stud," but, um ... Solomon Hill? The George-less Pacers desperately need small forward solutions. Vogel will apparently move little-used former New York Knicks shooter Chris Copeland into the mix at the three, but it wouldn't be surprising to see the defensive shortcomings that landed Copeland in ex-Knicks coach Mike Woodson's doghouse land him back on the bench. Hill joined him there for most of his rookie season — well, when he wasn't with Indy's D-League squad in Fort Wayne, at least — but the rising sophomore's 6-foot-7 frame and footwork could make him an intriguing defensive option. Vogel has said multiple times that Hill possesses the potential to become “an elite defender” and singled the second-year forward out on media day as a player capable of filling George’s shoes as the Blue-and-Gold’s top perimeter defender. Hibbert emerges from last season's struggles and this summer's quality time with Kareem a reinvigorated offensive monster. West shoulders a greater load without wearing down. An aggressive George Hill proves he can be a playmaker. Vogel gets creative, too, embracing the shooting of Copeland, Damjan Rudez and (possibly) Shayne Whittington to craft a better-spaced offense. Miles reliably bombs away, Stuckey's a Sixth Man of the Year candidate, Solomon Hill becomes a "Doberman," and Indy shocks the world by locking down one of the final two playoff spots in the shuffled-up East ... and welcomes George back for a first-round matchup with either LeBron James' Cavs or Derrick Rose's Chicago Bulls. Hibbert and Hill wilt under the all-eyes-on-me spotlight. West can't handle the uptick in minutes and responsibility. Vogel can't get comfortable with the defensive downside of big minutes for the likes of Copeland and Rudez, nobody can get to the basket and Indiana's offense plummets to dead-last in the league. An inability to contain perimeter scorers results in coverage breakdowns that create the shots Indy never used to give up — layups, corner 3s, you name it — and the league-best D drops to the middle of the pack. Bird grimaces through the least successful NBA campaign he's ever experienced, with a shot at 2015's No. 1 pick and George's hoped-for return serving as cold comfort. 28-54, Indiana's worst record in a quarter-century, slotting it in 11th place in the East.